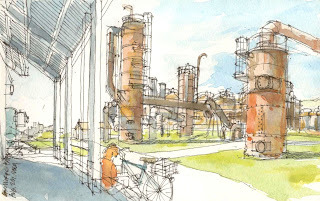 It was another great day with the Seattle Urban Sketchers . I always feel inspired after seeing everyone's work. Look forward to the next one. What a lovely sketch! You captured exactly the light and shadow we saw you working in! everyone should click on the sketch to fully appreciate the detail at a larger size, really inspiring work Gail! You are good Gail. Confident lines for such a complex scene. Impressive.